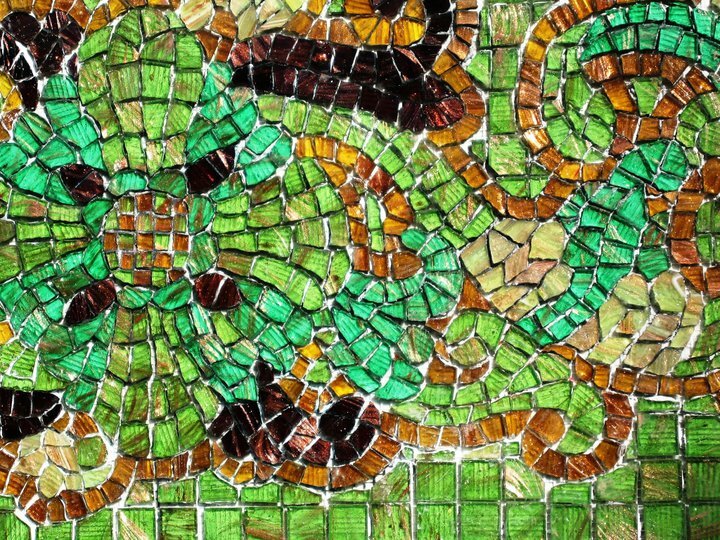 A mix of mosaics by Studio OzMosaics ranging from large scale projects to Sandy's fine artworks. 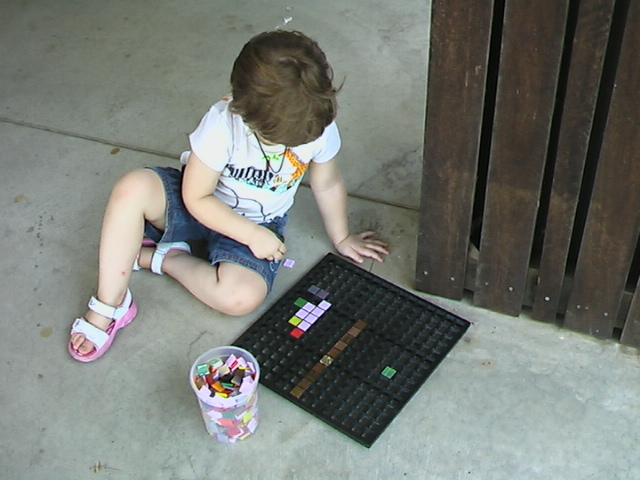 Please click the Play button arrow for auto slide show or click through the gallery thumbnails. 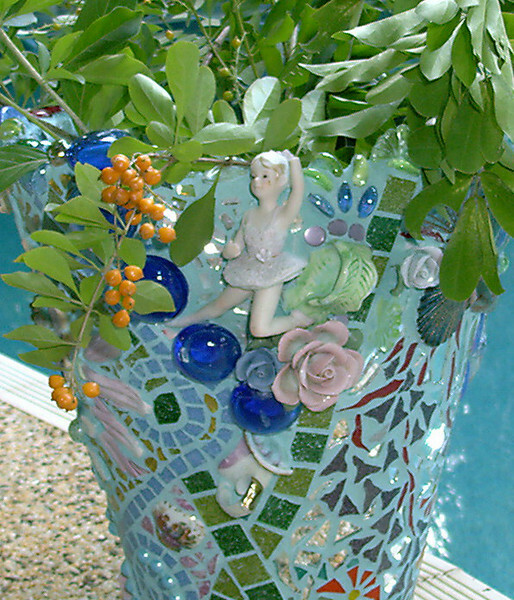 Photos may be enlarged to full screen viewing.Run your mouse over the images for information on the mosaics. 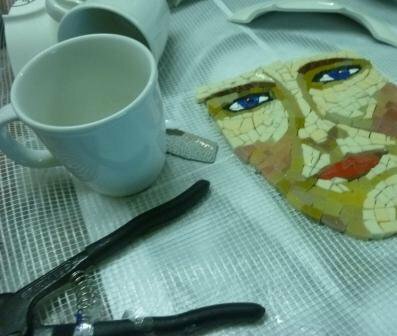 The brief: Working with Norfolk Island Art Society, create a mosaic mural to be installed at Norfolk Island Airport Departure Lounge. 150 years of Settlement. 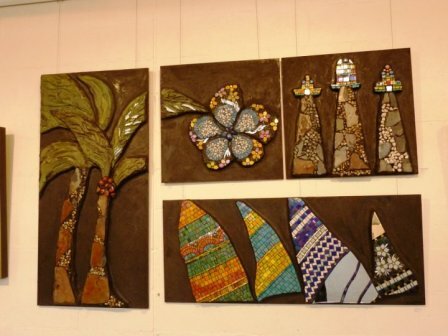 This mural shows community input in design and fabrication at Norfolk Island.Team OzMosaics flew to Norfolk Island and ran mosaic workshops to teach the helpers. 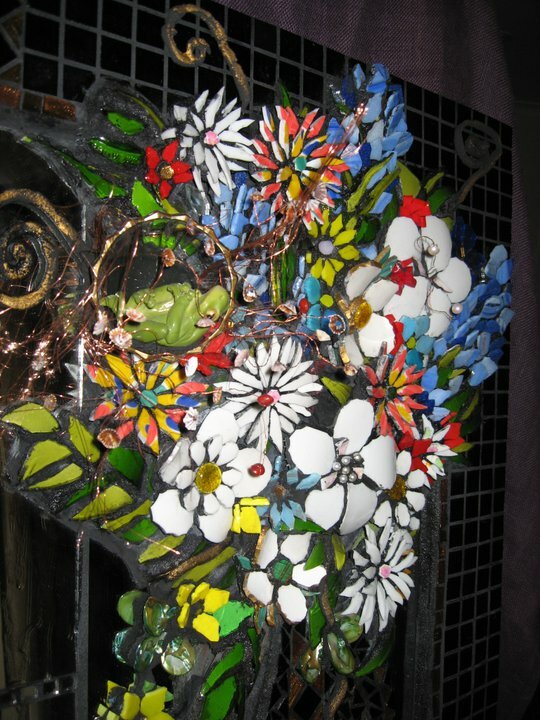 The mosaic took 4 weeks to make and install. 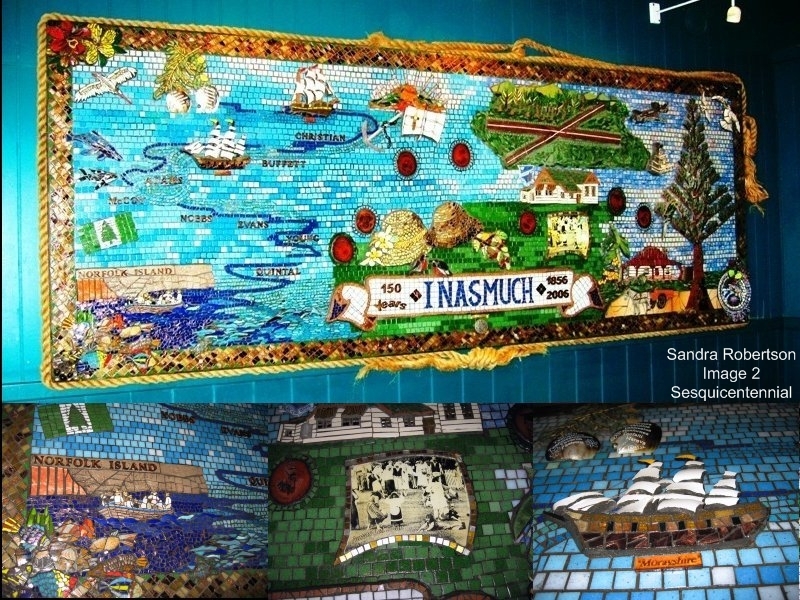 This is a unique mosaic with deep meaning, messages and community spirit. 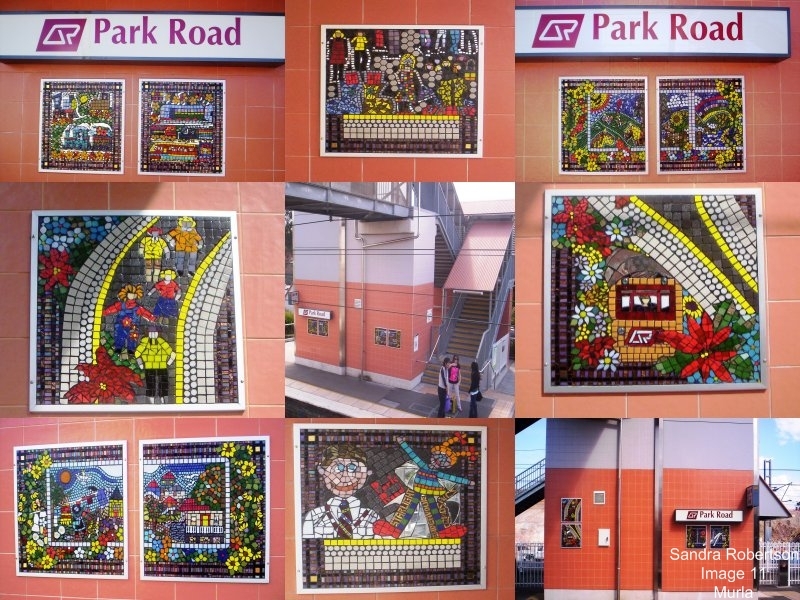 It was a privelege to be involved in this important public artwork. 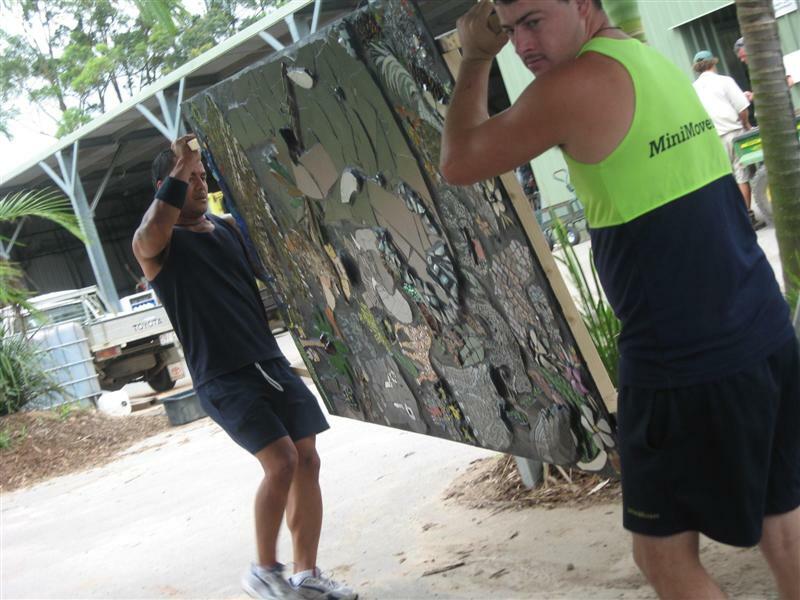 OzMosaics shipped all products, tools and workshop requirements to Norfolk Island. 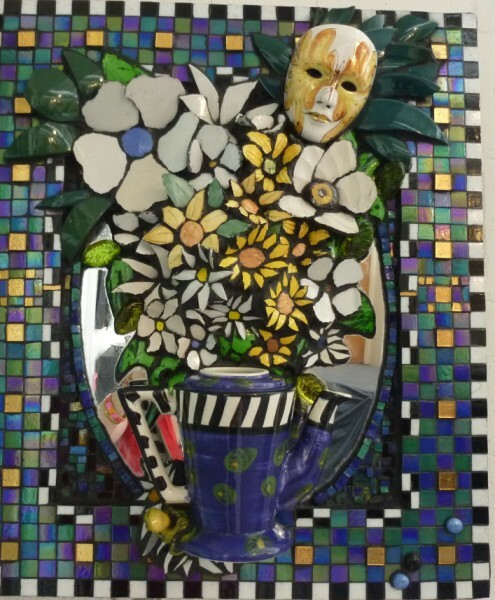 Residents were keen and many wonderful items were donated for the mural, including old pottery and glass. 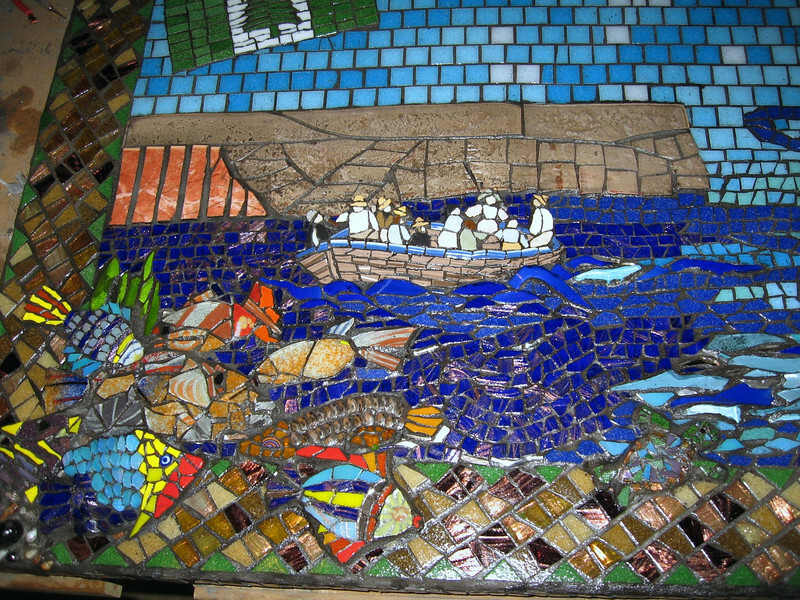 One of the two huge seats, with mosaic art panels made during the Numbelli Project. 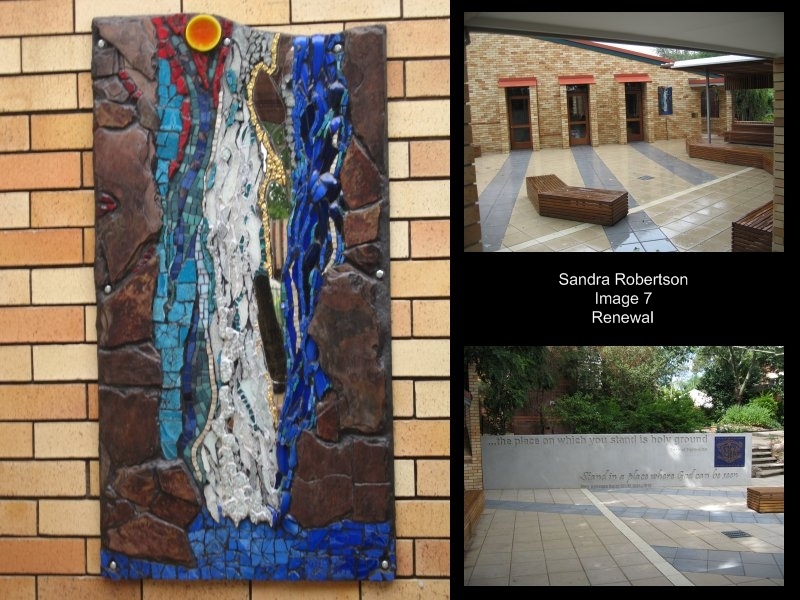 Award winning artworks - Ipswich City Council, Awards of Excellence. Numbellie Seat Project/Grant. 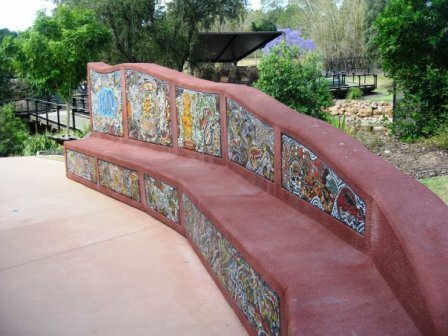 OzMosaics/PANI Project Working with 7 Ipswich Schools, Indigenous Artists, Storytellers and community, these magnifcent seats are installed in the Queen's Park animal enclosure, Ipswich. 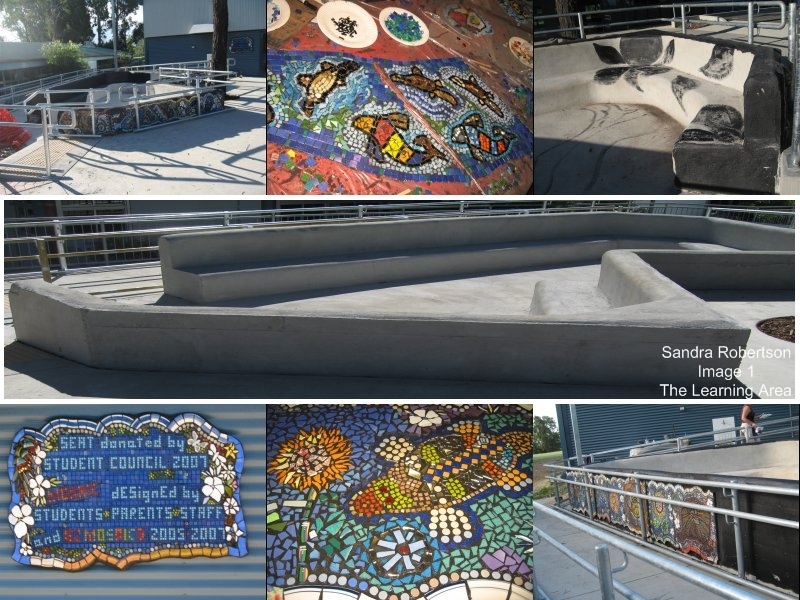 Mosaic panels tell the Indigenous story of the land, community and the project educated and brought together the community. 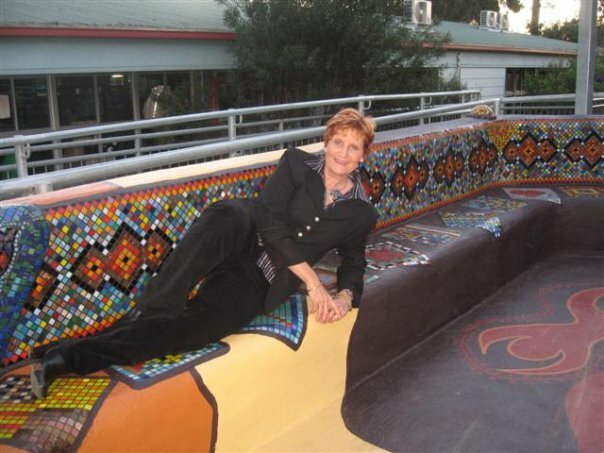 A section of the huge seating sculpture installed at Karalee State School. 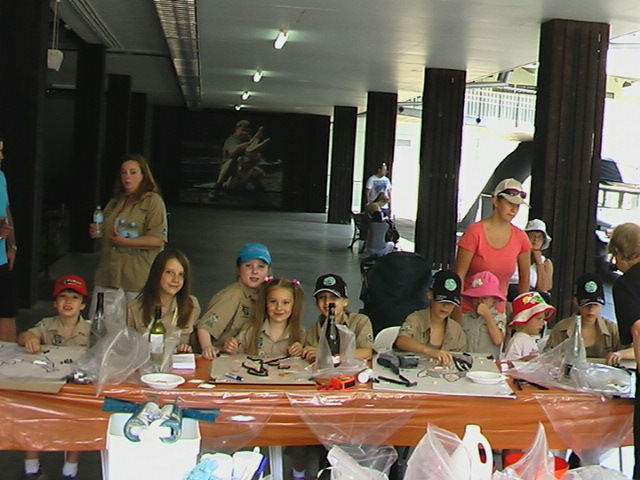 Photograph taken on opening day. 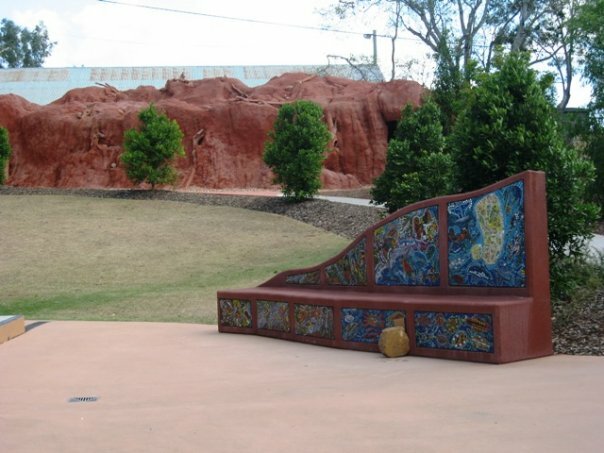 Bright paintworks featuring aboriginal symblos, brings the Rainbow serpent, mosaic creatures and water features together. 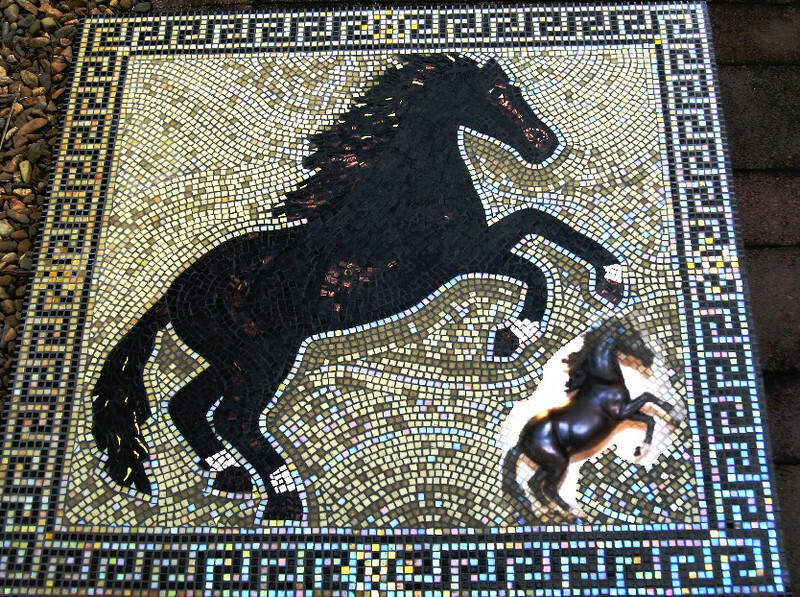 Based on a murana glass horse, the client requested a mosaic with a traditional mosaic influence. 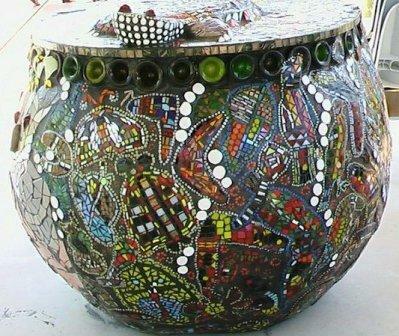 Mosaic ball sculptures made during community art workshops at Norfolk Island. 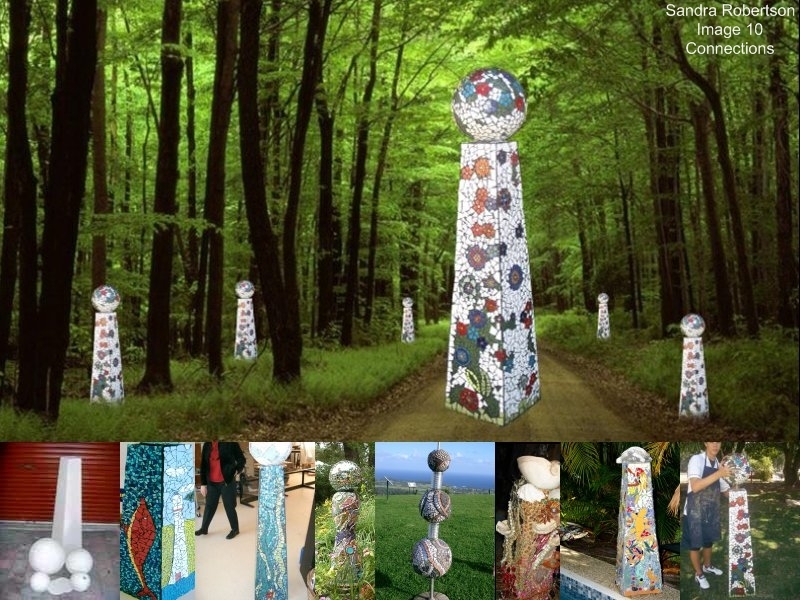 Temporary installation on Mt Pitt for Art in the Park. 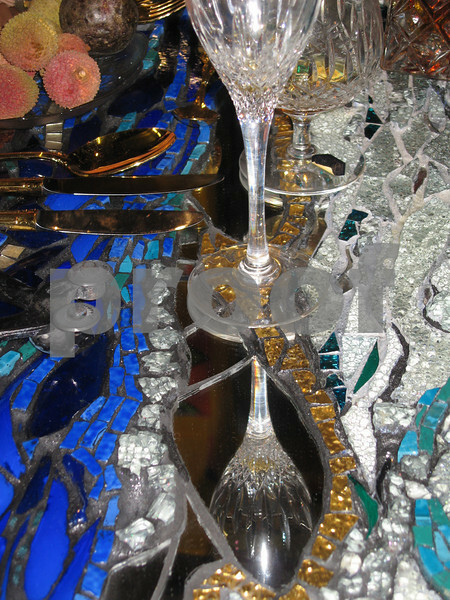 A gigantic mosaic sculpture forms the taBALL! 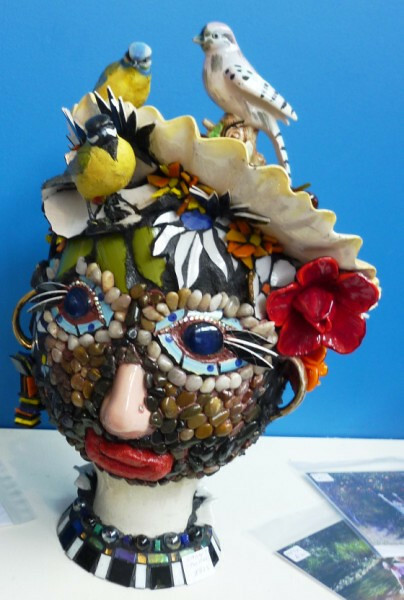 This ball features artworks made at Ipswich schools. 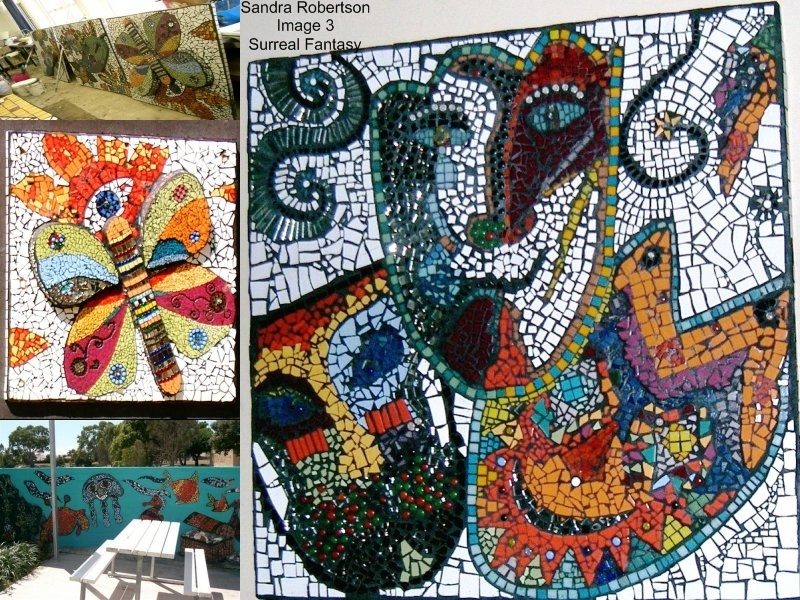 OzMosaics worked with Ipswich City Council, Park landscape architects, school teachers, helpers, parents and students and collaborated with Indigenous artists in the Ipswich area. 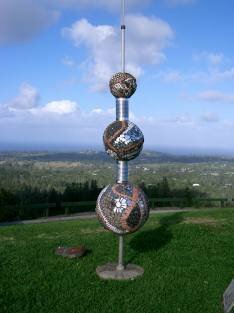 A useful public artwork, the ball is installed on the Arena stage in Ipswich. 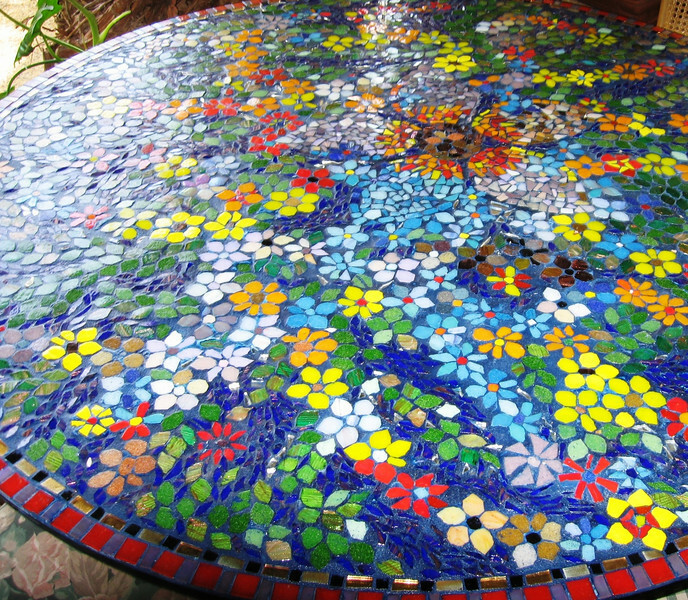 Mosaics include creatures and indigenous symbols, creating a bold statement and a handy lecturn and mosaic resting place/table. 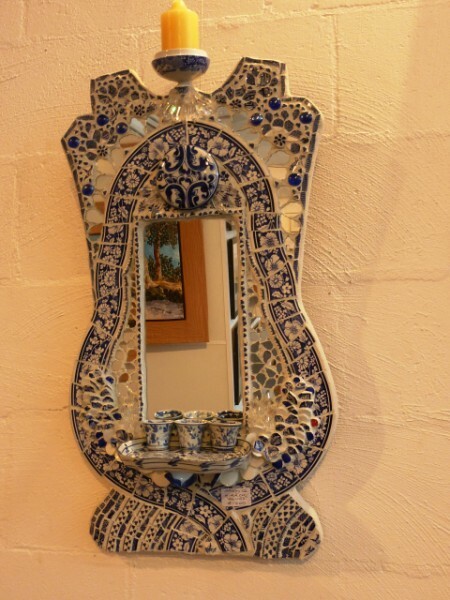 Client - Mission Beach Queensland Brief: Based on small photos, produce large scale wall mural for bathroom including two feature walls, mirror surrounds etc. 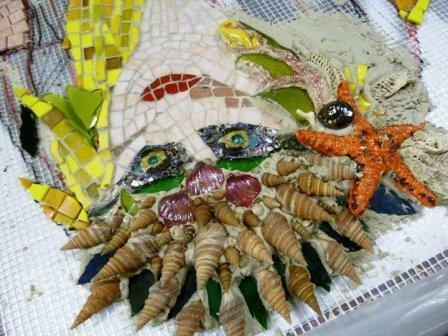 Client flew to Brisbane to discuss designs and Sandy gave a mosaic lesson. 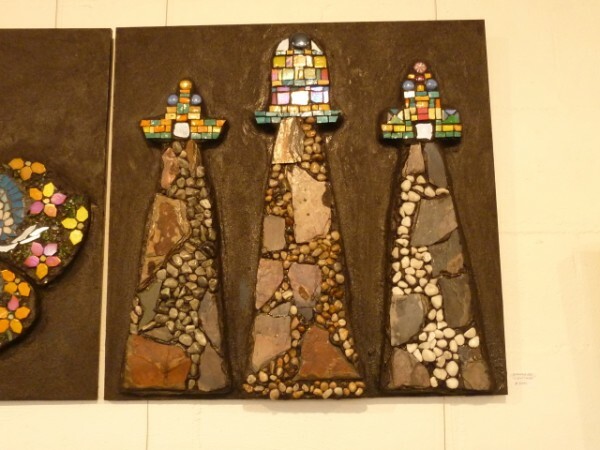 Client added mosaics to her kitchen, bathroom and garden sculptures. A magnificent home nestled in a rain forest setting with visiting cassowaries. 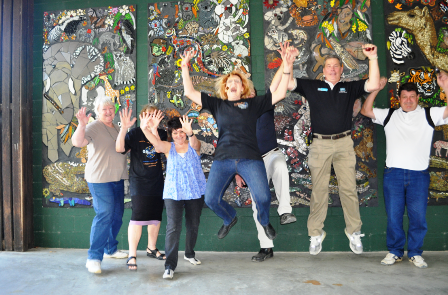 I flew to Mission beach to complete the mural installation. 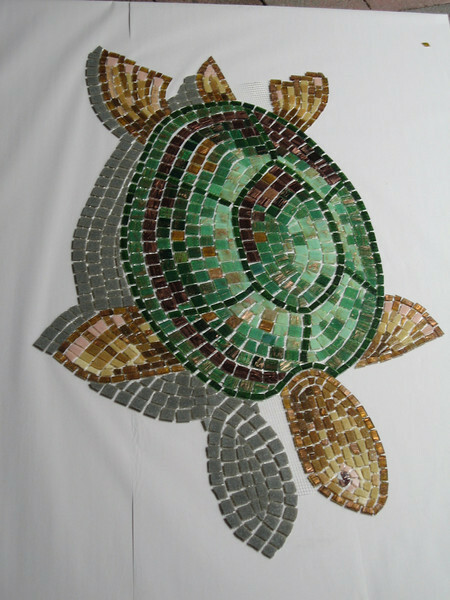 Mosaic was fabricated in Brisbane on mosaic mesh, cut into sections and assembled on site by OzMosaics. 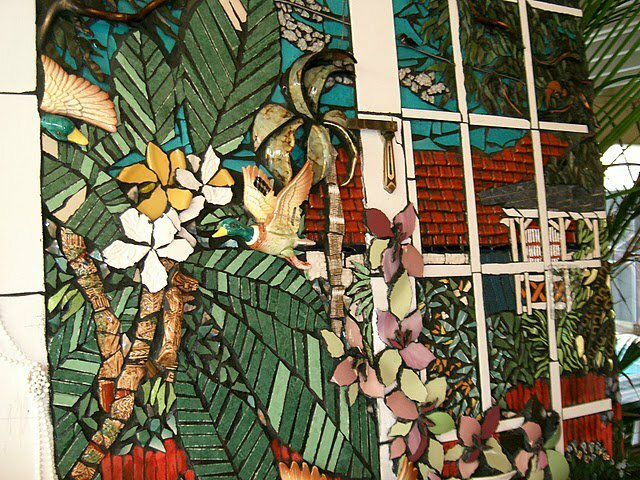 Large scale murals on fibreglass mesh. 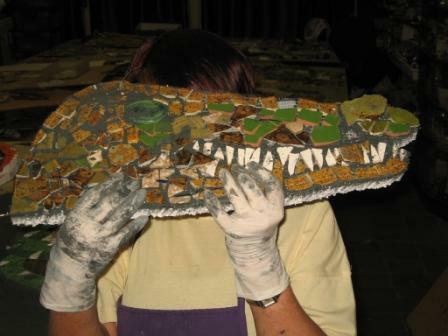 This method enables group mosaics, community artworks and large scale works to be cut down for transportation to site. Additions and alterations are possible with this method, allowing clients more freedom on site before installation. 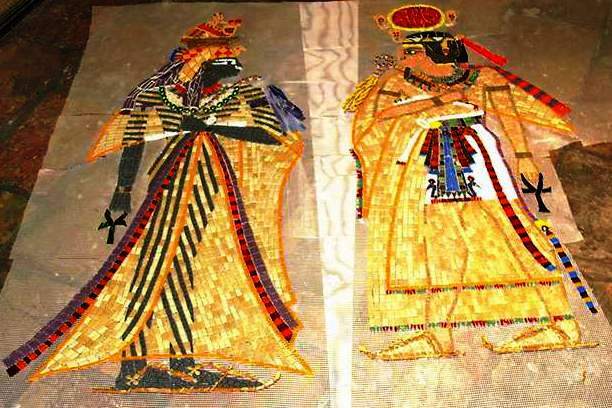 Detail of Egyptian mosaic mural. 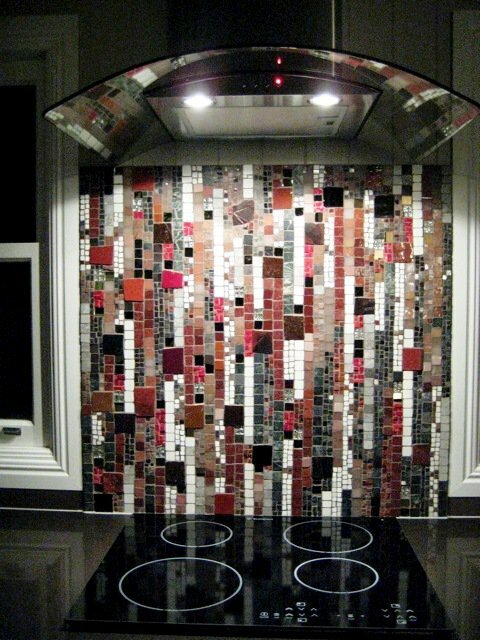 Contemporary mosaics with Queensland appeal. 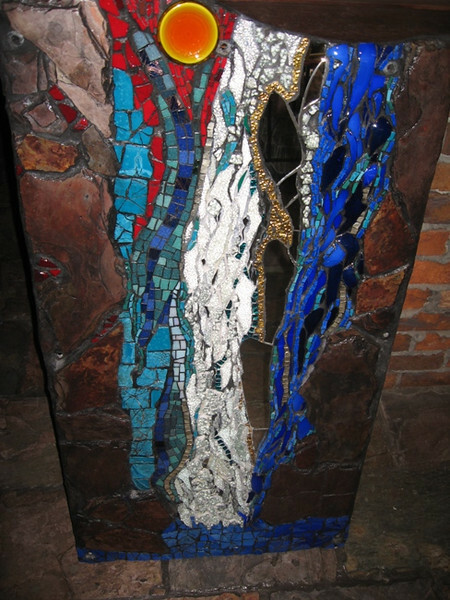 mosaic waterfall as part of Loreto project. 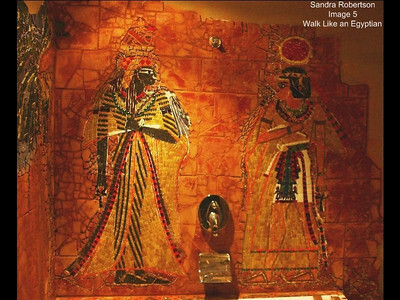 A sense of history of floors traversed in this contemporary mural. 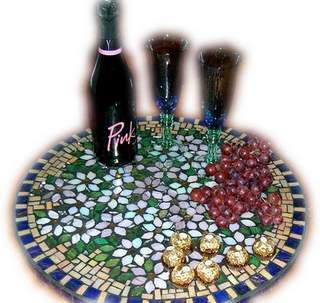 Contemporary mosaics, using fused glass, broken wine glasses, corks, cement swirl features, mirror and modern smalti glass. Queenslander deck - mosaic mural by Sandra Robertson. 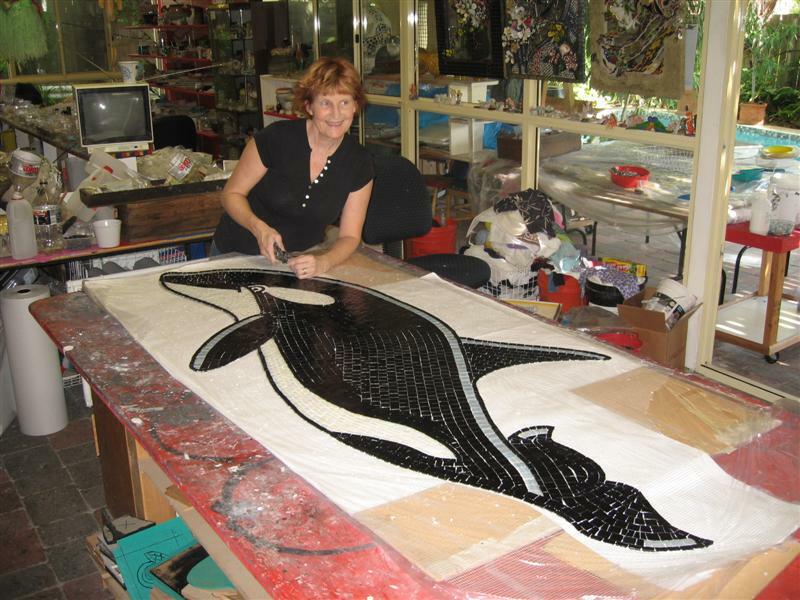 Australia Zoo murals during fabrication. 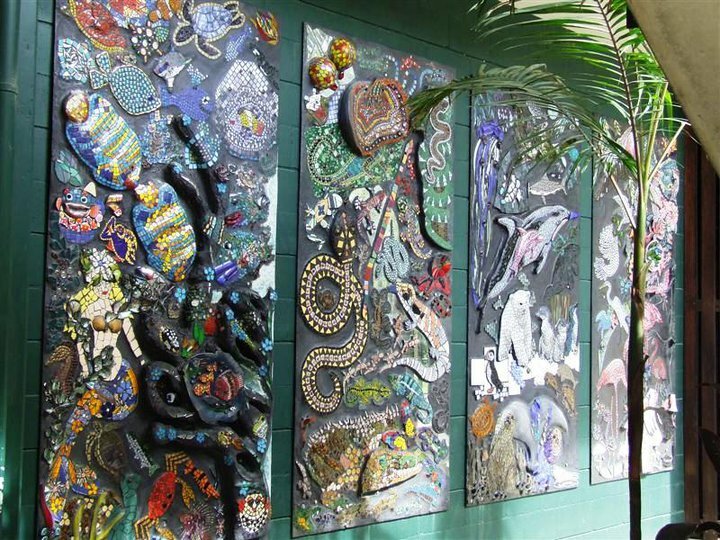 Installed at Australia Zoo, 10 huge panels represent mosaic artworks from mosaic artists and enthusiasts aroundt the world. 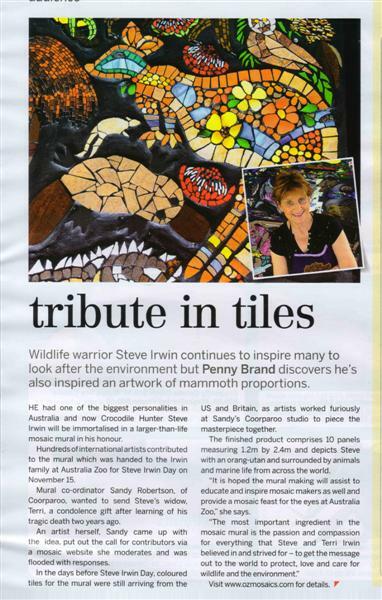 Steve Irwin Mosaic Tribute. 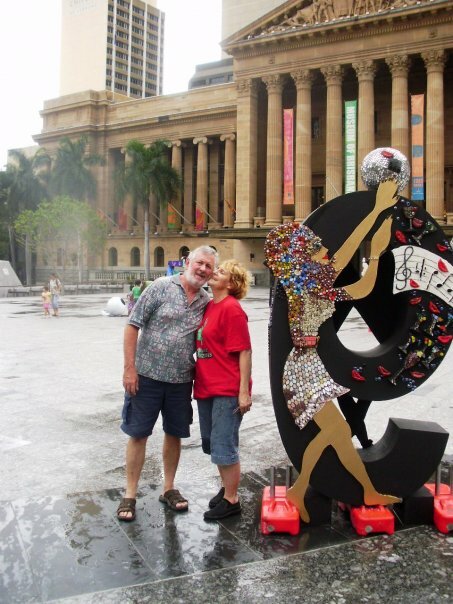 Brisbane City Council - Twelve days of Christmas. 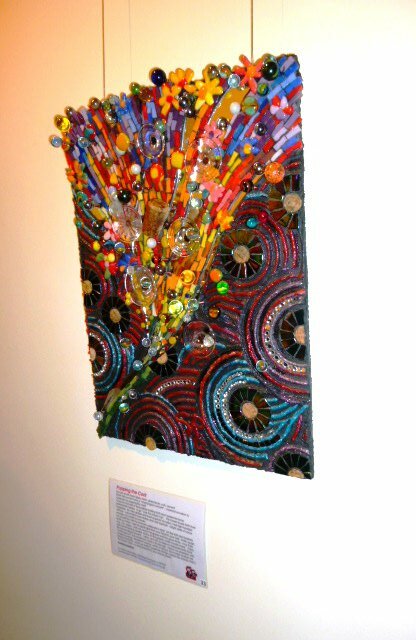 Art Exhibition King George Square. 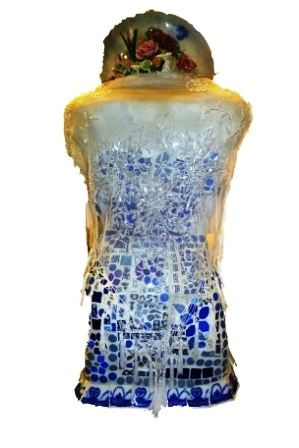 Day Nine sculpture "9 ladies dancing". 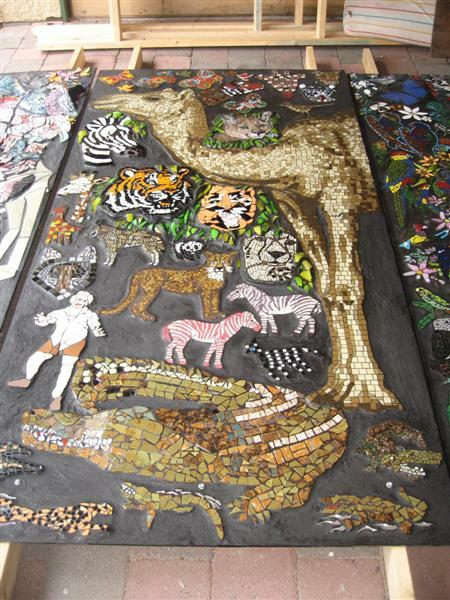 Mosaic panels and murals intalled in pool in Brisbane based on Balinese carvings. 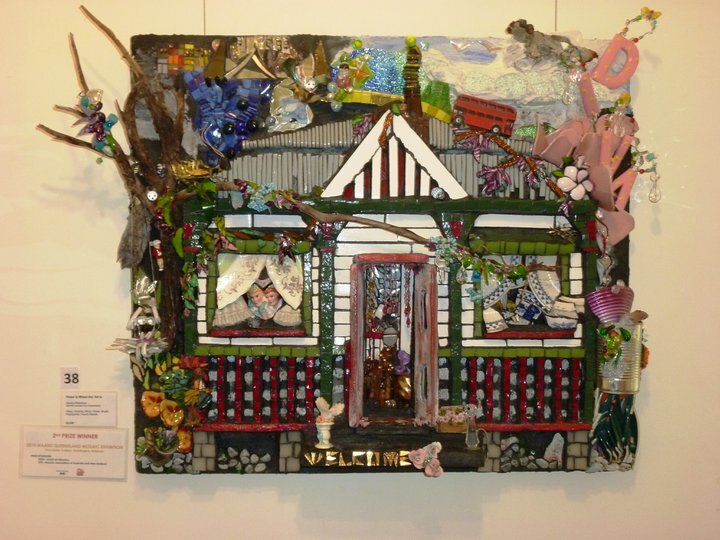 Award winning art at MAANZ Queensland Exhibition. 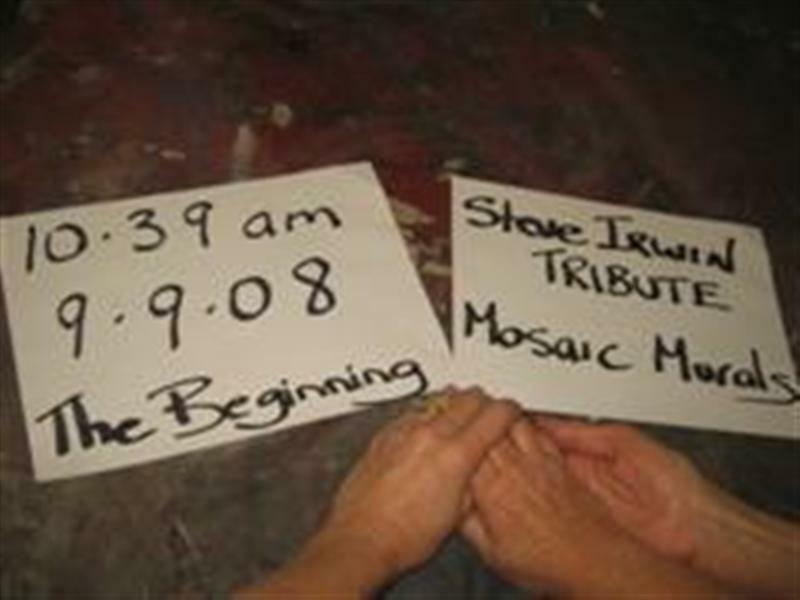 Commission in the making 2012. 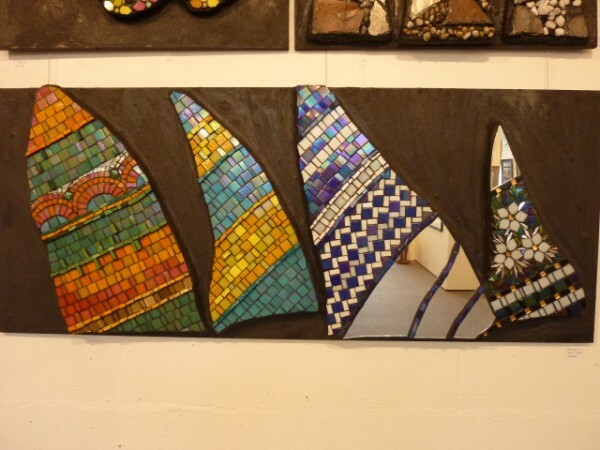 Joint exhibition with arists / Liz and Friends. 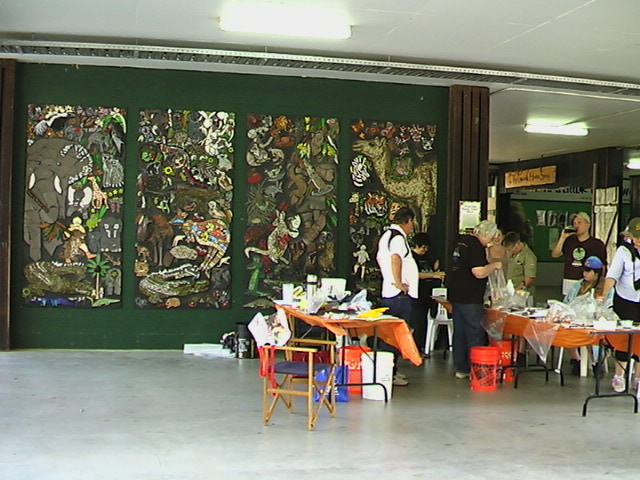 Bribie Island Art Community/Centre 2011. 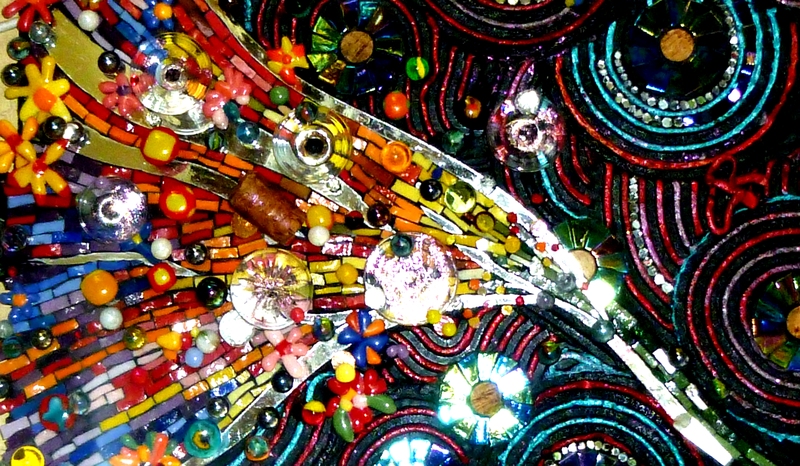 From the inside out; section of a mosaic mural by Sandy Robertson. 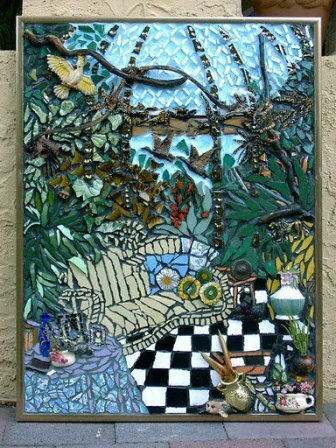 Based on views from her Queenslander deck, 3-D mosaics. Let it Rain! 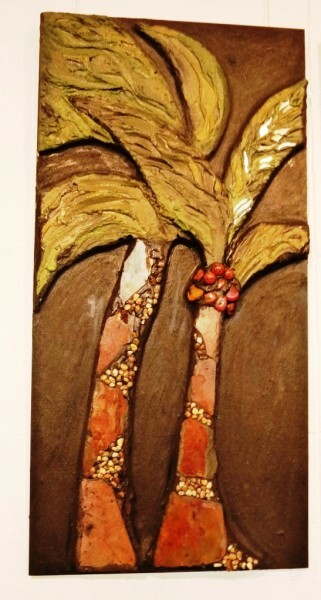 Mosaic made for Dalbly fund fundraiser. 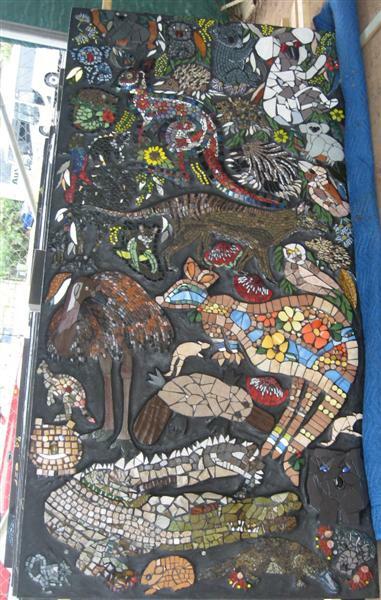 4 of the 10 mosaic murals installed at Australia Zoo. 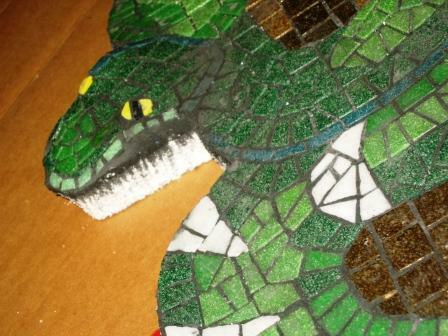 Another is in the making which was started on Steve Irwin Day 2011, working with children and visitors to Australia Zoo. 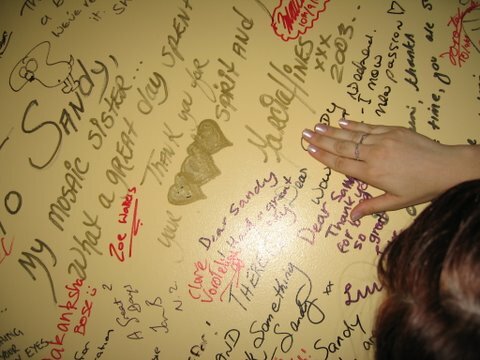 Special memory wall at OzMosaics. 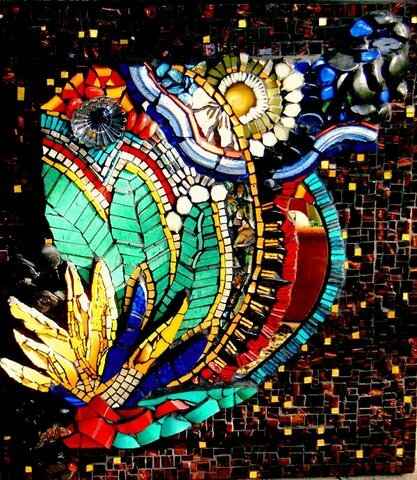 Mosaic inspiration - the joy of mosaics. 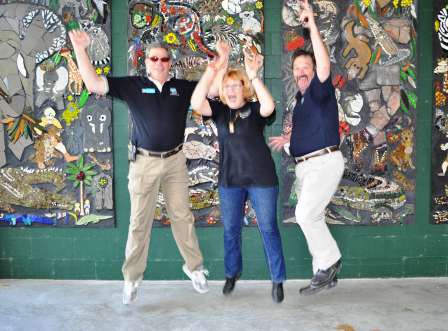 Team spirit - beautiful installations at Australia Zoo. 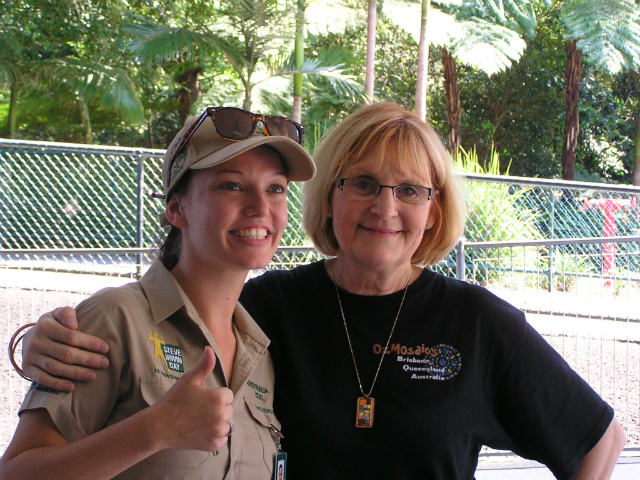 Special relationships with Australia Zoo through the arts. 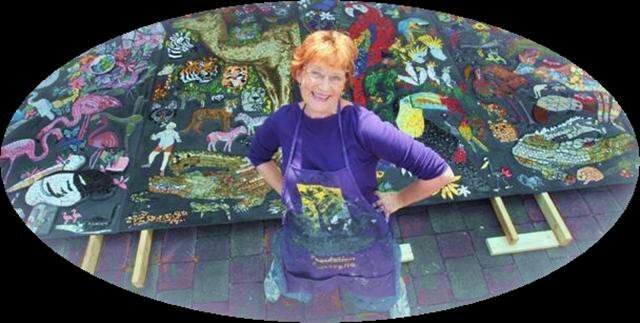 Working with children creating murals for Australia Zoo on Steve Irwin Day. 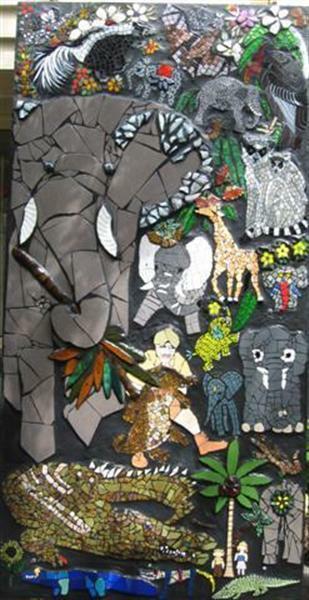 Mosaic workshop gets the creative juices running at Australia zoo. Sailing away into the sunset. 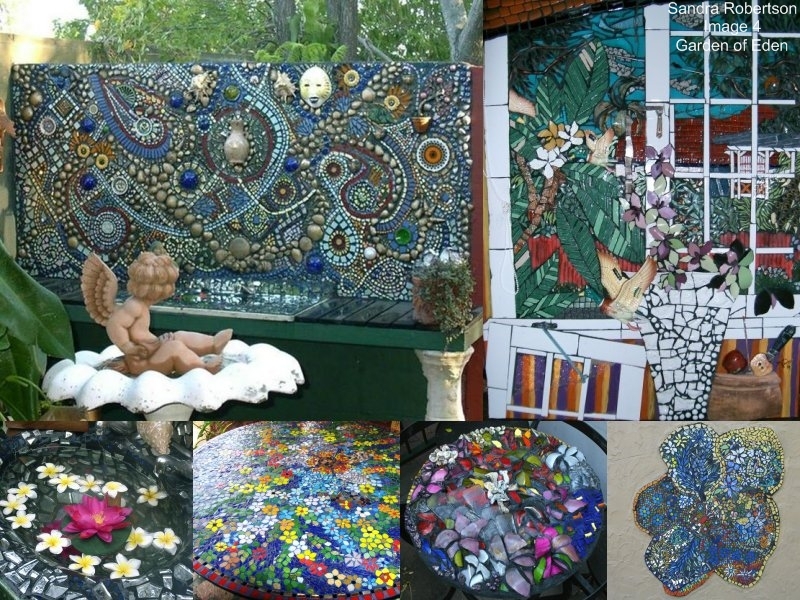 Sandy's mosaic artworks in her studio. 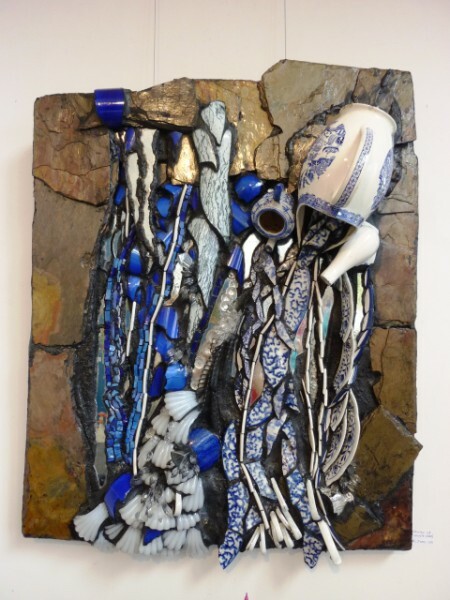 Memory art using found objects and blue and white china. 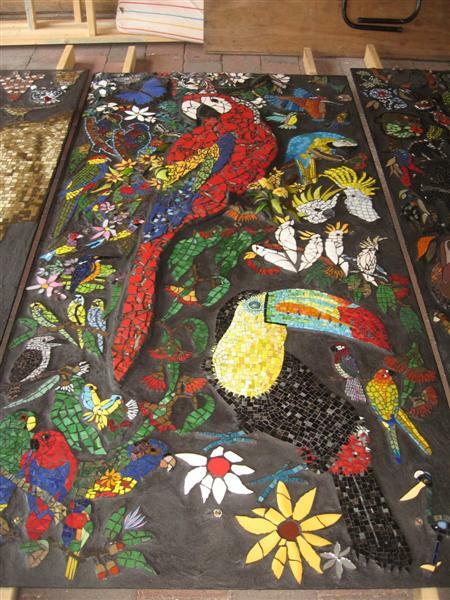 Bird mural at Australia Zoo. 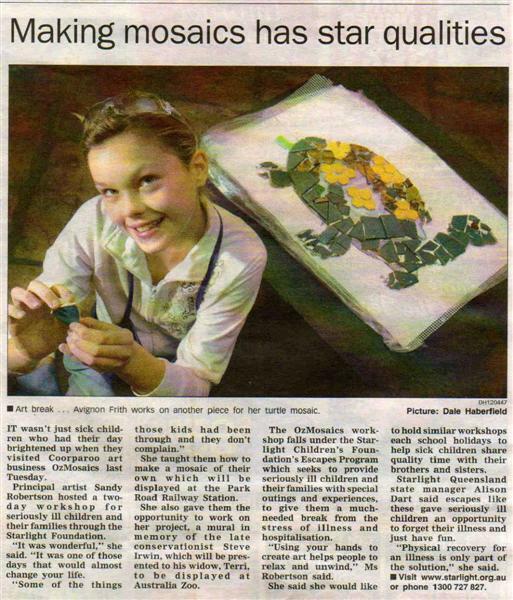 Sunday Mail promotes community art project by Sandy. 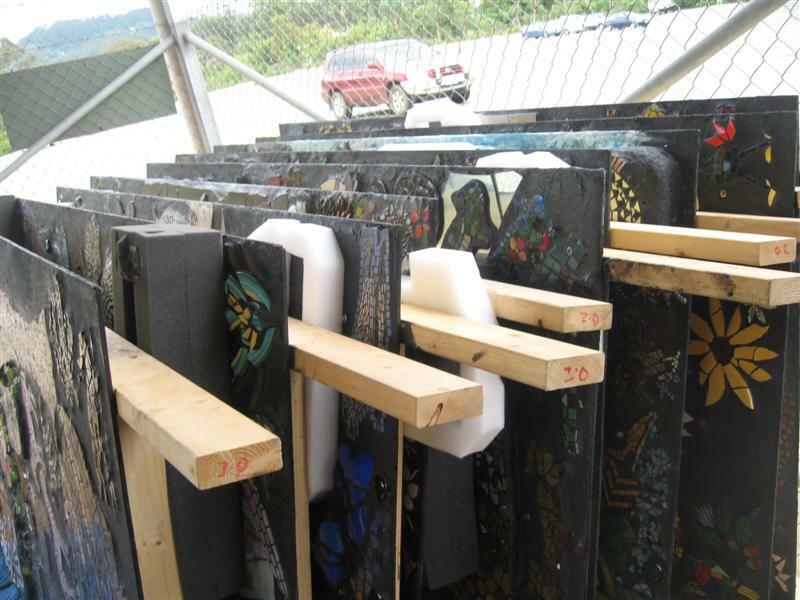 Once piece or a hundred may form a wall mural or sculpture. 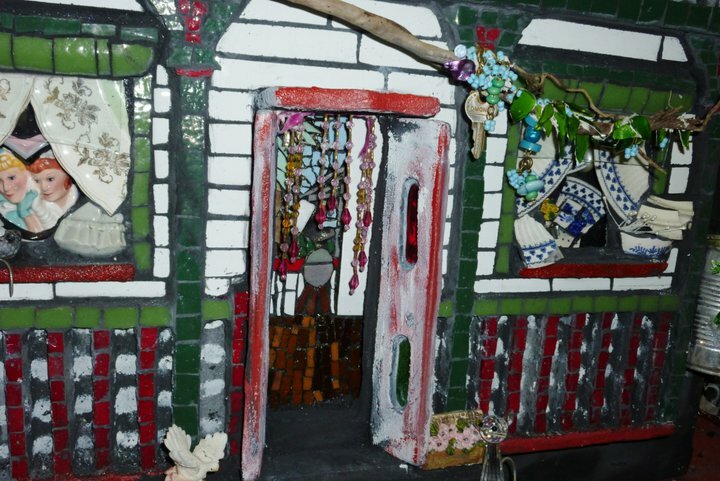 Polystyrene subststrates make light work of mosaic installations. 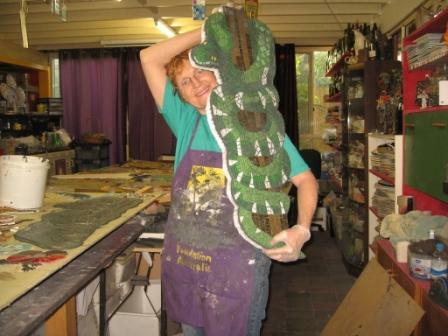 Green tree snake. 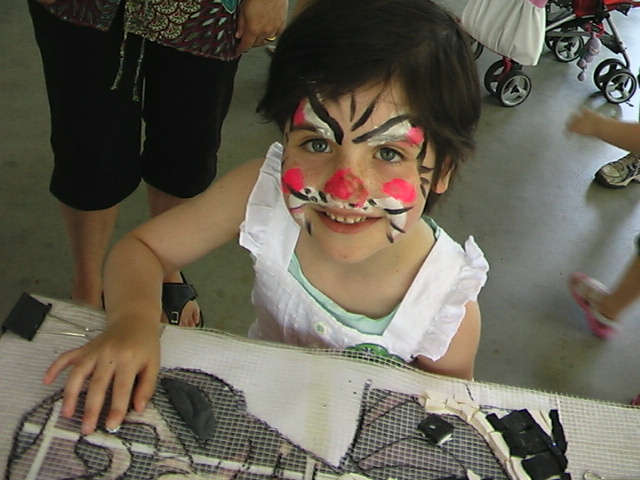 Glue me to a wall. 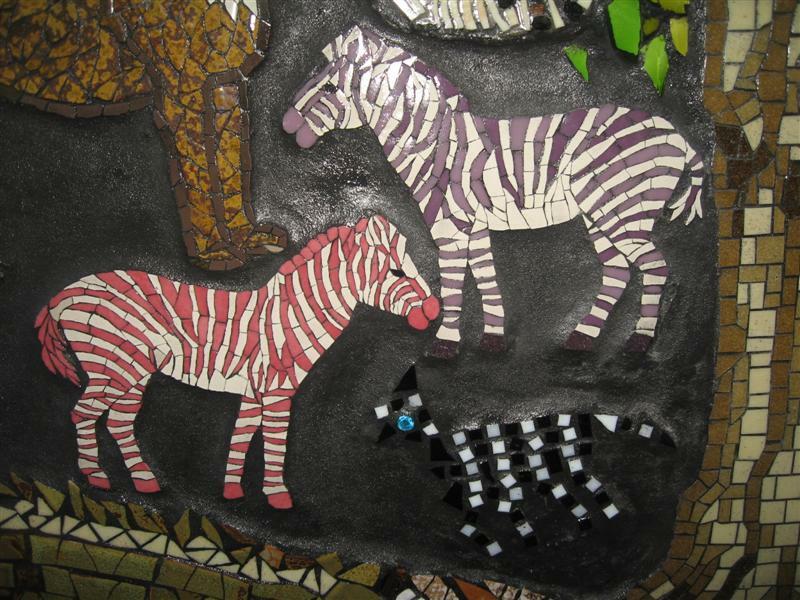 Mosaic zebras from France for the Steve Irwin Mural Tribute. 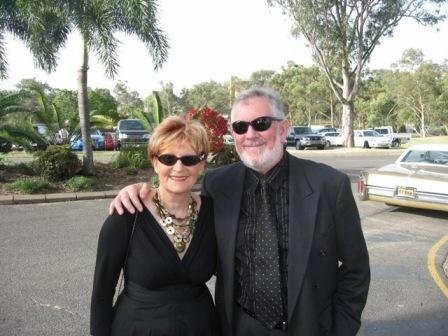 Team OzMosaics - Dave and Sandra Robertson. 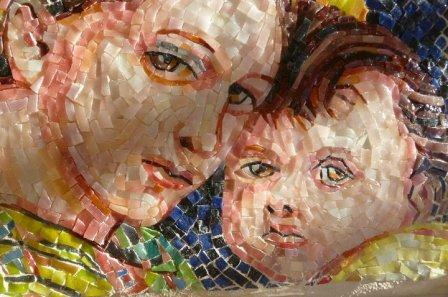 Mosaic portrait in the new Dynasty smalti. 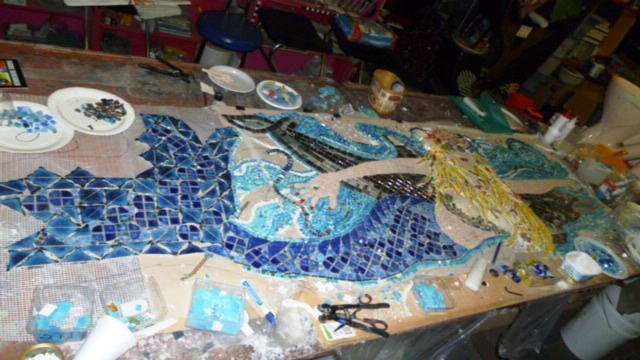 Head of mermaid mural for pool installation in Brisbane. 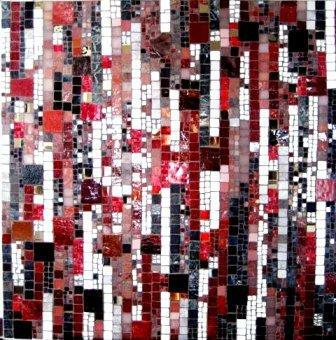 Mosaic wall art by OzMosaics. 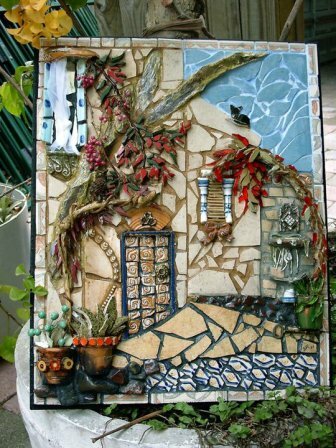 Mosaic "Courtyard Mural" by OzMosaics. 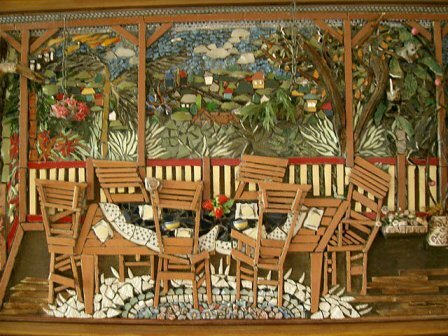 Queenslander deck - wall art by OzMosaics. 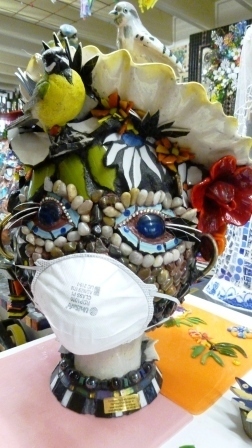 All safety measures are taken. 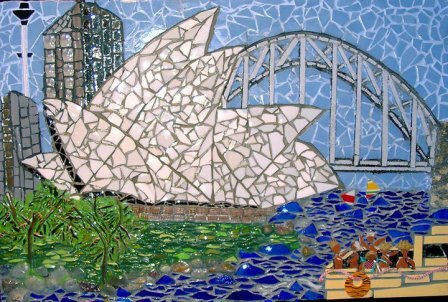 Early mosaic of Opera House by Sandy Robertson.